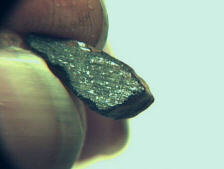 The Glenrothes (pronounced Glen-roth-ees) chondrite is the first ever meteorite find on UK soil.....I say "first", because the Danebury meteorite of Hampshire, England, was discovered in an Iron Age pit, and was obviously an observed/witnessed fall that was deliberately placed there, as some kind of wonderous relic. I was lucky enough to have made the Glenrothes discovery during the Summer of 1998 - the full story is in the September/October 1999 edition of Voyage! magazine. Several small fragments were found in relative close proximity to each other and are probably part of a small though larger stone that has broken apart and fragmented during many years of freeze/thaw exposure to the UK's cold & damp weather. The total known weight of this find is 14.8g (comprised of many small fragments) with the main mass just 1.1g - no more fragments have been found during recent visits to the locality and the site has almost certainly yielded all of the fragments that can practically be recovered. This meteorite has now been formally classified by Dr.Monica Grady of the Natural History Museum, London and Arabelle Sexton of the Open University, Milton Keynes where the olivine and oxygen values were found to be right on the edge of the H-group field. Mean olivine compostion is Fa21.4, towards L-group values. It is shock stage S3 and weathering grade W4. The oxygen isotopic composition proved to be slightly out of the main H-group field, towards the terrestrial fractionation line but was considered to be a result of terrestrial weathering. The consensus is that Glenrothes is an H5 chondrite and the full analysis and report was forwarded to the Nomenclature Committe of the Meteoritical Society who have now approved the Glenrothes name and classification......this will appear in the June 2000 issue of the Meteoritical Bulletin. To my knowledge, very few people have tried their hand at meteorite hunting in the UK because our wet climate is considered very hostile for the preservation of meteorites, though the Glenrothes find at least proves that it can be possible to discover new "old" meteorites in the British Isles, albeit as small weathered fragments. 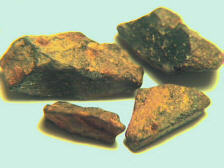 Small sub-gram fragments in the order of 0.3 - 0.5g each, weathered externally and with a powdery rusty crust. Small fragment with cut face beside a matchstick for scale. Close-up of the fragment pictured above.